Congratulations are in order for the Looking Glass Restaurant in Bar Harbor, Maine. They were voted the “Best Breakfast with a View” in Maine, by the editors of Yankee Magazine. We think you will agree that the view (and the food) is unparalleled at the Looking Glass. 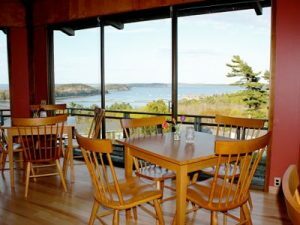 Even if you didn’t rise to catch the real event, you can feast on the classic “Cadillac Sunrise” (two eggs, bacon or sausage, home fries and toast), along with panoramic views over Bar Harbor and the Porcupine Islands from the glass-walled almost-hilltop restaurant…Breakfasts: from $7.95. 50 Eden Street.